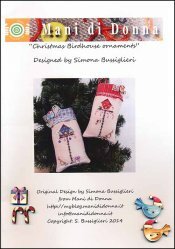 Christmas Birdhouse Ornaments [H1743] - $13.00 : Yarn Tree, Your wholesale source for cross stitch supplies. Cross Stitch pattern from Mani di Donna. These birdhouses are all decorated for Christmas! The blue birdhouse has a couple of trees decorated for Christmas stitched beside it with ornaments hanging down. A small gift embellishment has been placed underneath the birdhouse. The red birdhouse features candy canes hanging down. A candy cane embellishment has been placed underneath the birdhouse. A bird embellishment has been placed on the top of each of the ornaments. The bird, candy cane & present embellishments are included with this design. Stitched on #8291 Zweigart Belfast Linen 32ct. Light Mocha. Stitch count for the blue birdhouse is approximately 53W x 62H. Stitch count for the red birdhouse is approximately 50W x 57H.